December 3rd 2009 saw an avalanche of Anambra citizens at the playgrounds of the Holy Trinity Catholic Church in Onitsha, Anambra State. This is as the National Working Committee [NWC] of the Peoples Democratic Party [PDP] led by the Chairman Vincent Ogbulafor, launched the kickoff of the Soludo campaign. The event which was slated to start at 10am saw over one hundred thousand of Anambra sons and daughters assemble at the Holy Trinity [Catholic] Church before 10am. Oddly, the occasion wore surprising celebratory regalia. This is noting the atmosphere under which the campaign kickoff was launched. President Yar'Adua's illness and absence from the country, as expected, was to have dampened the spirit of the celebrants. But the evidence on the ground proved contrary – except from the absence of the Vice President, Goodluck Jonathan which Ukpakareports.com gathered was due to President's YarAdua's illness and absence from the country. And as gathered, the organizers of the occasion made efforts to keep the kickoff event low key – out of respect for the President's condition. That notwithstanding, significant sectors of the elected PDP officials were in attendance or dully represented. Senator Ikechukwu Obiorah represented the PDP in the Senate while Honorable C.I.D. Maduabum represented the PDP in the House of Representatives. 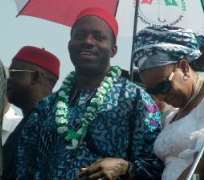 Both of them made speeches beckoning the people of Anambra State to throw their support to Prof. Soludo and the PDP. Also mounting the stage was the wife of the former vice president of Nigeria, Mrs. Beatrice Ekwueme who said the opening prayer - she prayed that the detractors within the party will see the light and have a rethink. This was also espoused by the longtime Anambra politician, Arthur Eze. He asked political detractors to simmer down as he referred to them as mere “Political Militants”. Also taking the stage was the representative of the Anambra State House of Assembly – who was sent by the speaker of the State Assembly [Nebe Anayo] in the person of Hon. Uche Ogbonna. With the Chairman of PDP, Vincent Ogbulafor mounting the podium, the raving bands and musical acts that had assembled at the playground of the arena – began their drumming. And as the Chairman spoke, he made it clear that Soludo's emergence was a divine one that was the making of God. He went on to pronounce Soludo the “governor-in-waiting”. To cheers, Prof. Charles Soludo and his wife took to the podium where he was handed the party's flag by the national party chairman.